The former MP and government minister will be installed in succession to business entrepreneur Richard Farleigh at an official ceremony this autumn. The position of University Chancellor is unpaid and partly ceremonial but Sir Simon has pledged to support the University as it strives to transform lives and provide opportunities for individuals, local business and the many diverse south London communities. 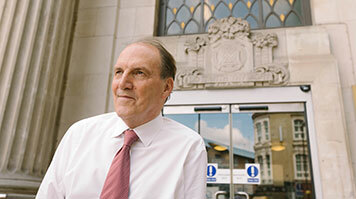 Sir Simon Hughes said: "Over the past 30 years I have seen the very positive impact London South Bank University has had on the lives of thousands of local people. LSBU is a place that provides our communities with access to opportunity and delivers an excellent student experience to thousands every year. Prof David Phoenix, Vice-Chancellor of LSBU said: "At LSBU our influence is increasingly global but we will always be rooted in south London. Simon has dedicated many years to the service of the local population and his appointment symbolises the importance of our local community in everything we do." The appointment has been welcomed across the political spectrum and comes just a few weeks after Simon Hughes announced he would be taking a step back from front line politics. The Liberal Democrat peer, Lord Palumbo of Southwark, said: "Simon Hughes is an inspired choice as our local university's new Chancellor. London South Bank University is now nationally recognised as a shining example of all the best qualities embodied in the modern university sector. Simon's commitment, energy, experience, knowledge and vision will add huge extra value to LSBU. Watch out London South Bank - Simon will be a Chancellor like none you have seen before!" The crossbench peer, Lord Ouseley of Peckham said: “Sir Simon is a highly credible and personable individual who will enhance the reputation of LSBU, both locally and internationally with his enthusiasm for education and for the respect he has for people of all backgrounds, characteristics and circumstances . He will champion equality, inclusion, diversity and cohesion and LSBU will be all the better for having Simon Hughes as it Chancellor. A great choice for this position." Shakira Martin, the national President of the National Union of Students (NUS), said: "It is refreshing to know that Simon intends to be a hands-on Chancellor. There is much work to be done in the HE sector, with an ever changing political landscape and the uncertainty posed by Brexit. I am sure Simon will use his experiences, networks and knowledge for the benefit of students at LSBU". Watch a short video to find out what it means to Sir Simon to be appointed as Chancellor and his ambitions for the University, our students and staff.